Bradley Manning Tried to Warn Us About the Crisis In Iraq. Will We Listen to Him Now? Despite efforts to discredit him, Bradley Manning's extraordinary statement in court revealed that, like other whistleblowers, he was driven by his concern for the greater good. In 2010, while stationed at Forward Operating Base Hammer in Baghdad, Pfc. Bradley Manning decided to approach a superior officer in his chain of command to voice his concern about something he had stumbled upon in his capacity as an intelligence analyst. His unit had been helping Iraqi federal police identify suspects for detention and discovered that fifteen men had been arrested for producing “anti-Iraqi literature." After having a high-resolution photo of the “literature” translated into English, Manning discovered that the writing was hardly criminal; it was a "scholarly critique" of Iraqi Prime Minister Nouri al-Maliki. But his superior officer did not want to hear about it. Manning knew if he continued to assist the police in identifying political opponents, innocent people would be jailed, likely tortured, and “not seen again for a very long time, if ever,” as he told a military courtroom in Fort Meade, MD on February 28. Hoping to expose what was happening ahead of the Iraq parliamentary election, on March 7, 2010, Manning shared the information with WikiLeaks. On March 19, as Americans observed the tenth anniversary of the Iraq War, Manning remained behind bars, facing the prospect of twenty years in prison—and possibly much more—for taking actions that were motivated by concerns about the effects of the US invasion. The anecdote he shared about the Iraqi federal police was part of a longer explanation in court, detailing, for the first time, his motivation for leaking the historic volume of documents, videos, military logs and diplomatic cables to Wikileaks. Surreptitiously recorded in the courtroom, Manning’s statement offers, perhaps more than anything that has been written about his case to date, proof that Manning is the classic whistleblower: his concern above all else was for the greater good and he wanted to spark a much-needed public debate. So he took action, at great personal risk, and is paying the price. One recent article, a co-authored op-ed in the New York Times, took two opposing views of Manning himself and cast them aside to consider the broader significance of what he did. First amendment crusader Floyd Abrams and Harvard law professor Yochai Benkler laid out the “chilling precedent” established by his prosecution, despite disagreeing with one another about the merits of Manning's actions. One does not have to consider him “a paragon of heroic whistle-blowing, to understand the threat” his case poses to the rest of us, they wrote. But whistleblowers like Drake argue that Manning is indeed that paragon of heroic whistleblowers, and that his words in court prove it. “If there was any remaining doubt regarding his motives or intentions, they were fully dispelled in his statement,” Drake told me in a recent interview. Many have characterized Manning as irresponsible; in the Times, Abrams describes him as showing “a devil-may-care obliviousness to genuine national security interests.” But none of the information Manning shared with WikiLeaks was disclosed on a whim. His statement in court that day made clear that he had considered the nature of the information and what it would mean if it were made public. In the case of the “Collateral Murder” video, Manning discovered that Reuters had submitted a Freedom of Information Act (FOIA) request for the video but US Central Command (CENTCOM) refused to “give a time frame for considering a FOIA request, while also claiming that “the video might no longer exist.” That CENTCOM would not voluntarily release the video troubled Manning. Jesselyn Radack, a former Justice Department employee who blew the whistle on the inhumane treatment of “American Taliban,” John Walker Lindh, sees Manning's “deliberative thought process” regarding the release of this information as characteristic of “a lot of whistleblowers,” as she told me in a recent interview. While many have suggested that Manning disclosed too much information, and that he might be more of a whistleblower had he only released the “Collateral Murder” video, Radack says that, in her experience, someone can be prosecuted for unauthorized disclosures regardless of the volume of information disclosed. The popular perception of Manning has been that he is a “leaker,” because he circumvented what are considered more proper channels to get his information out into the world, but Radack says most whistleblowers are not aware of the proper channels they are to go through until after they blow the whistle. She has represented multiple whistleblowers who went to the inspector general of the wrong agency or went to an agency that did not afford them protection because they were national security or intelligence agency employees. Manning is not a leaker. He is a whistleblower who disobeyed military codes and US law governing the handling of classified information. He has pled guilty and accepted responsibility for his acts of civil disobedience. But the Obama administration has an interest in casting him as a leaker, having prosecuted a record number of other “leakers” and also fought to keep an increasing amount of information it claims is sensitive to “national security” secret. It has failed to address the problem of over-classification while at the same time clamping down on the free flow of information between government employees and members of the press. If the Manning case is seen as part of a larger trend toward reestablishing—and even expanding—the ability to protect state secrecy, it becomes clear that his prosecution is not simply about a soldier acting on decisions he did not have the authority to make. It is about whether Americans are going to allow the government to persecute an individual because he or she had the courage and audacity to reveal corruption that government officials wished to keep hidden out of sight. Manning wished to warn Americans of the unseen consequences of a dangerous foreign policy. Ten years after the invasion of Iraq, it is clear that he was right. Kevin GosztolaKevin Gosztola is a writer for Firedoglake.com, who regularly covers WikiLeaks, whistleblowing, secrecy and various issues created by the national security state of America. He has been regularly traveling to Fort Meade to cover the court martial of Pfc. 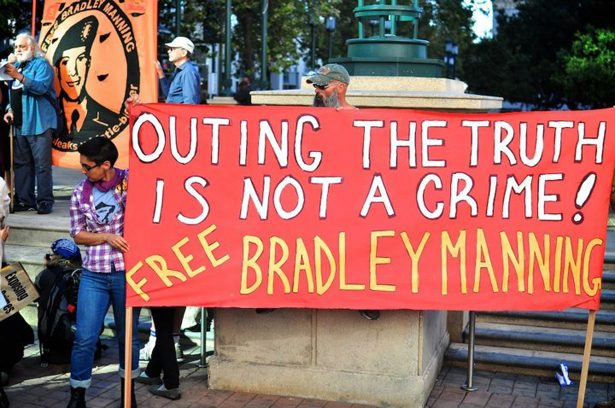 Bradley Manning and co-authored Truth and Consequences: The US vs. Bradley Manning with The Nation's Greg Mitchell.